Five bonus tracks are released for the first time on CD! Guitarist Barney Kessel's On Fire was the one and only album released by Phil Spector's short-lived label called Emerald. As the label went out of business, the album became out of print quickly. Because of its rarity, the original album is highly sought after in the collectors' market. Recorded live at a Hollywood club called PJ's in 1965, On Fire captured Kessel in his top form, with his dazzling tecnhique and imagination. For this CD reissue, SSJ added five bonus tracks recorded for a TV broadcast in 1962, which had never been released on CD before. 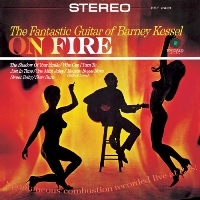 This is an important album by Barney Kessel and a must-have for his fans! Recorded on January 10, 1965 at PJ's, Hollywood. Stereo (Tracks 1-7). Aired on CBS Television on January 12, 1962. Mono (Tracks 8-12).